[prMac.com] Fort Lauderdale, Florida - kode80 LLC has announced the release of its new iOS game 1-bit Ninja Remix Rush and 1-bit Ninja Bundle. 1-bit Ninja Remix Rush takes the retro aesthetic, 2 button control and precise level design of the original and remixes it in a procedurally generated endless runner format. 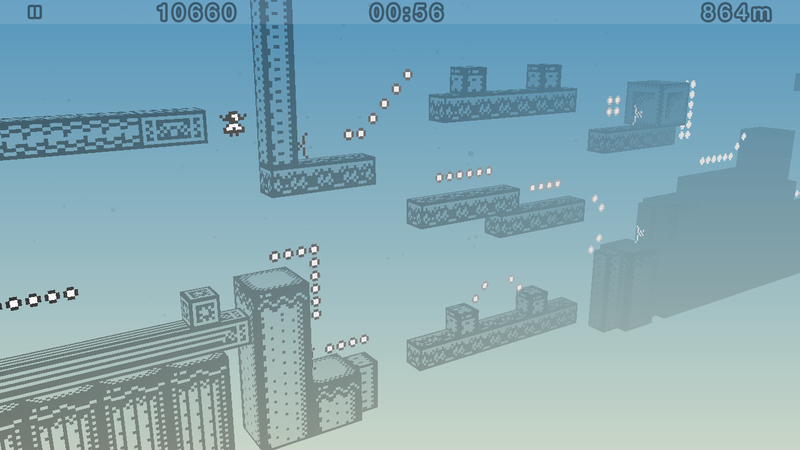 In 1-bit Ninja Remix Rush players must navigate a constantly changing landscape of platforms, enemies and power-ups to travel as far as possible before the timer runs out. Collecting bits and big bits as one goes will push back the clock giving Ninja the chance to travel even further. Rather than presenting the player with completely random platforms, 1-bit Ninja Remix Rush uses brand new layouts and remixed layouts from the original game as templates for the level generation process. This allows each play through to be different from the last while still having a hand designed feel. 1-bit Ninja Remix Rush employs the same control scheme as the original 1-bit Ninja. The screen is divided into two halves with each half acting as a button. This two button approach removes a lot of the problems commonly associated with touch screen controls; accurately touching the desired button and the need for on-screen controls. In 1-bit Ninja Remix Rush the two buttons act as forward and jump. As in the original 1-bit Ninja, there is no back button in 1-bit Ninja Remix Rush pushing the player to plan and execute jumps without hesitation. 1-bit Ninja Remix Rush mixes retro handheld inspired art with a 3D camera and evolving color palette all running at a smooth 60 frames per second for a look and feel unlike anything else on the App Store. Game Center leaderboards and social sharing functionality are also included. For fans of the original game or new fans that want to experience both games, a 1-bit Ninja App Bundle is also available at a discounted price of $3.99. 1-bit Ninja Remix Rush is $1.99 (USD) and available worldwide exclusively through the App Store in the Games category. The 1-bit Ninja App Bundle contains 1-bit Ninja and 1-bit Ninja Remix Rush at a discounted price of $3.99 (USD) and is available worldwide exclusively through the App Store also in the Games category. kode80 LLC was founded in 2009 by Ben Hopkins to provide software development services to clients around the world and games, tools and toys to the masses. Ben has been writing software for over 15 years on a variety of platforms ranging from game consoles to desktop to mobile. Previous iOS Apps from kode80 (HoloToy and 1-bit Ninja) have won various awards, been featured by Apple and hit the top App Store charts worldwide. Copyright (C) 2009 - 2015 kode80 LLC. All Rights Reserved. Apple, the Apple logo, iPhone and iPod are registered trademarks of Apple Inc. in the U.S. and/or other countries.